The AKG N60NC is an on-ear, Bluetooth wireless, noise canceling headphone. Styling is elegantly simple: upside-down puft gray lollypops on each ear. Materials and build quality look just about right at this price. It's a nicely built headphone. The pleather over foam headband is fully covered and has a good feel, but tends to touch in one spot at the top of the head. Fortunately, the headphone is light and has good caliper pressure on the ears, which tends to stabilize these headphones and remain comfortable. Ear pads covers are good quality pleather over 1/2" memory foam; pads are 2 3/4" in diameter with a one inch center hole. I found the N60NC comfort above average for an on-ear. The earpads are particularly nice. Headband adjustment end-caps pull out to reveal metal detented sliders. On-line customer reviews indicate this is a significant improvement from the plastic sliders of earlier models. Sliders are marked and adjustments a tad stiff but nicely secure. Ear capsule yokes swing fore and aft on on a headband end-cap swivel; the single sided yoke attaches and swivels at the rear of the ear capsule. Ear capsules can rotate flat and swing inward to nestle in the arch of the headband for compact storage and transport. This hinge mechanism can be made to make a few klunk noises when manipulated, but I wouldn't call it rattly at all. Seemed up to snuff to me. A tidy neoprene soft case is included. I like this case quite a bit for it's compact utility and the cushioning of the neoprene. Also included is: a USB charging cable; a 4 foot flexible, cloth covered cable with one-button remote; and airline adapter. Inserting the 2.5mm TRRS plug of the wired cable into the bottom to the left ear capsule will automatically turn the Bluetooth portion of the electronics off, but noise canceling can still be turned on and off the the power switch. 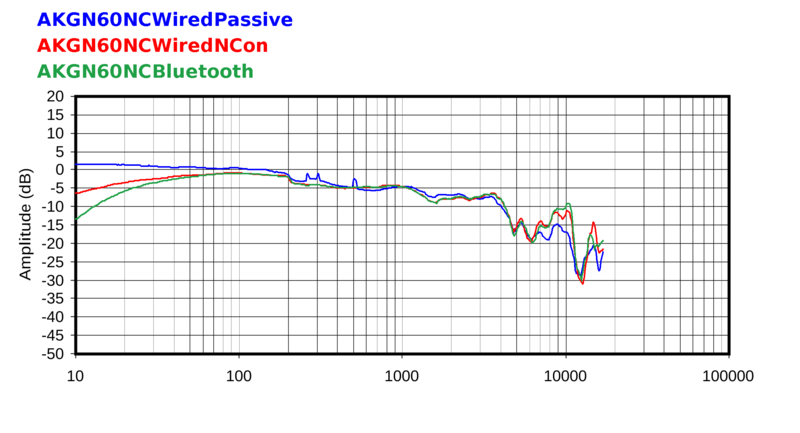 The N60NC has three modes of operation: Passive on the wire, NC active on the wire; and Bluetooth wireless with NC on. 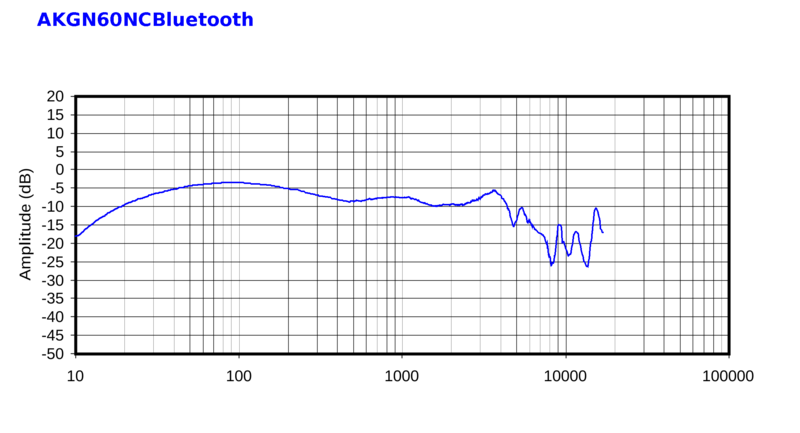 Noise canceling cannot be deactivated in Bluetooth mode. The headphone uses Bluetooth 4.0 and supports: A2DP V1.2, AVRCP V1.4, HFP V1.6, HSP V1.2. Battery will last about 15 hours wirelessly, and about 30 hours when wired with NC active. It takes about 2 hours to charge from a mostly depleted battery. I did have a few problems pairing up the N60NC. On both my iPhone and iPad I would sometimes have to "forget this device" and restart Bluetooth on both the headphone and player in order to get the devices to pair. Not sure what was going on there. I had no problems with my Android phone. 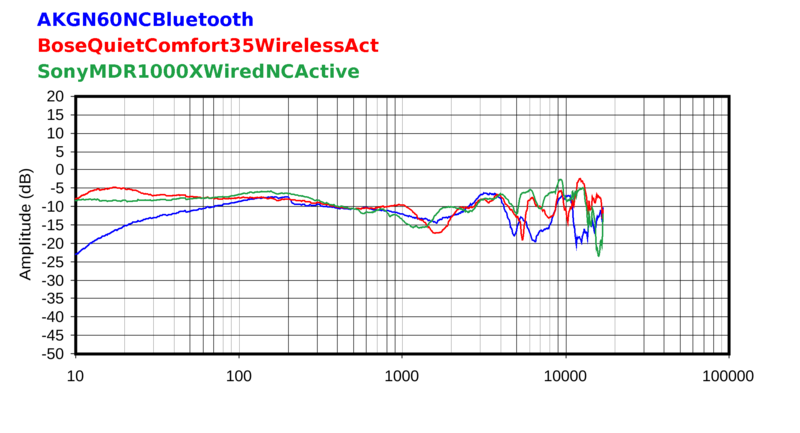 Noise canceling is effective, but doesn't seem to isolate as much as the better noise cancelers like the Bose QC35. I can't really decide on this phone. It's like they tried to make a harmanphone, messed up the subbass with the DSP, and got some weirdly diffuse-field upper mids, 2-4khz range. I'd still pick MDR1000X / Bose QC35. This has too little treble, and if you want a harmanphone, you'll want more bass. 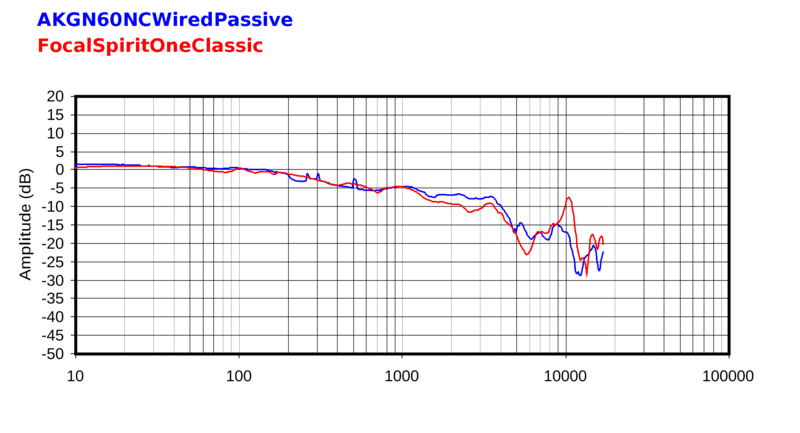 This is less weird in the 1-2khz range though, where both QC35 and MDR1000X have a dip. That low-midrange hardness could be resonance from empty cups. I think a lot of people would benefit from you including a picture of the inside of the cups in your reviews. Give manufacturers points for building well-damped headphones. Maybe it'll work as motivation. Also, what could have cause those sharp notches in the lower mids in wired passive mode? Ho good is the noise cancelling compared to the Bose? These are on ears so the noise cancelling is never going to be as good as over ears such as the Bose. Indeed they are not as I have owned both. The AKGs are excellent as portable, foldable, easy to use headphones with better than average noise cancelling and better than average sound quality. In fact I prefer their sound signature to the Bose. Even better value if you go for the version without the Bluetooth nonsense. Ear pads covers are good quality pleather over 1/2" memory foam; pads are 2 3/4" in diameter with a one inch center hole. I found the N60NC comfort above average for an on-ear. essay help The earpads are particularly nice. Bluetooth or wired version ? Hi Tyll, thanks for your expert review. I was wondering, in terms of sound quality, what is the best option to go for: the bluetooth or the wired version ? Thanks for bringing your knowledge with this blog !